ABU DHABI, 21st November, 2017 (WAM) -- H.H. Lt. General Sheikh Saif bin Zayed Al Nahyan, Deputy Prime Minister and Minister of the Interior, attended the signing of a Memorandum of Understanding, MoU, between Khalifa Student Empowerment Programme, 'Aqdar' and the Forum for Promoting Peace in Muslim Societies (FPPMS) on the sidelines of the Aqdar World Summit. 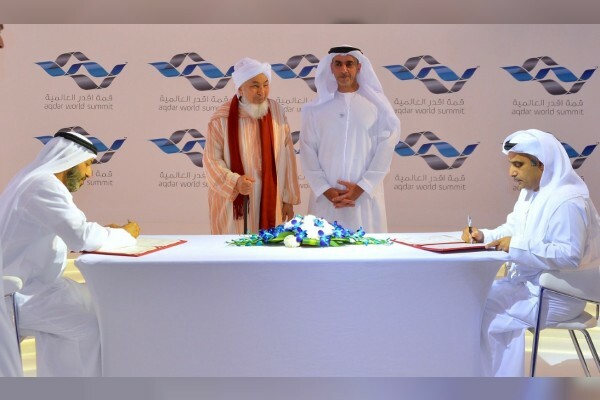 The MoU was signed in presence of Sheikh Abdullah bin Bayyah, Chairman of the FPPMS, by Dr. Mohammed Matar Al Kaabi, Chairman of the General Authority for Islamic Affairs and Awqaf (GAIAA), and Colonel Dr. Ibrahim Al Dabal, General Coordinator of the Aqdar programme. The MoU seeks to strengthen cooperation between the two institutions in the fields of education and public awareness and development of their targeted programmes, as well as the exchange of expertise and knowledge on issues of common concern. Sheikh Saif also attended a youth circle that discussed the role of youth in promoting social security. Shamma bint Suhail Faris Al Mazrui, Minister of State for Youth Affairs, and Sheikha Munira bint Hamad Al Khalifa from Bahrain were also in attendance. The youth circle, organised by Ministry of Interior's Youth Council and Emirates Youth Council, discussed the role of youth in promoting social security and world peace with the participation of students from different universities and schools and a number of students nominated by the Police College in Abu Dhabi.